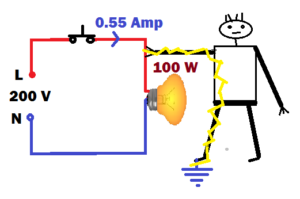 Problem 1: A person touches live wire of a 100 watt closed circuit. 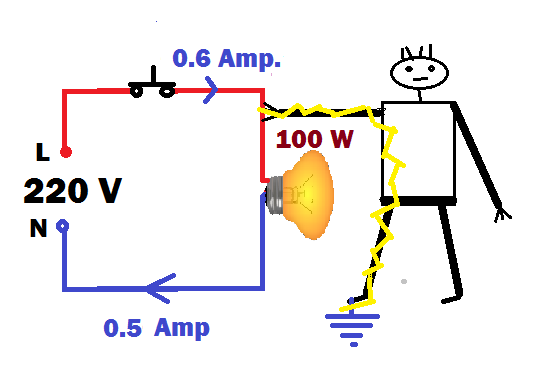 If supply voltage is 200 volt and total current flow in a circuit (when touches) is 0.55 ampere, then find the resistance of the human body? Solution: The circuit shown in diagram is similar to a parallel resistive circuit. We are interested to find the resistance of human body. In order to make this problem easy, let’s draw a resistive circuit of given diagram. Here, RB is resistance of bulb. RH is Resistance of human body. 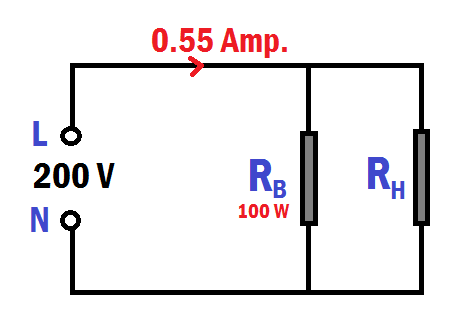 As RB and RH are connected in parallel, so 0.55 current will divided into two parts. Total current of the circuit is current flow through RB and RH. 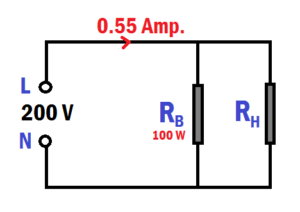 In order to find current through bulb, first we have to calculate its resistance (RB). In short, Resistance of human body is 4000 ohms. Problem 2: A person touches live wire of a closed circuit. The supply voltage is 220 volt and total current flow in a circuit (when touches) is 0.60 ampere. 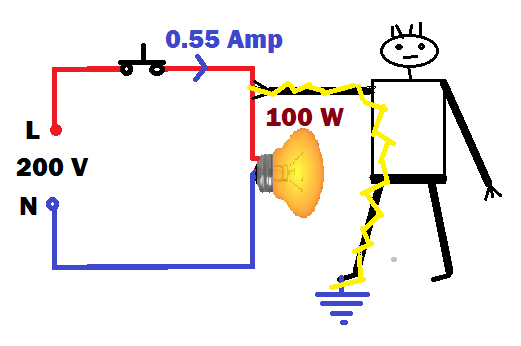 If the current flow through bulb is 0.50 then find the resistance of the human body? Solution: This problem is almost similar to above one. It is more easier to solve. Let us consider RB is resistance of bulb and RH is Resistance of human body. As we discussed in problem 1, RB and RH are connected in parallel, so 0.55 current will divided into two parts. Total current of the circuit is current flow through RB and RH. In short, Resistance of human body is 2200 ohms.